When I first encountered the work of Marija Gimbutas in a library in country Australia at the beginning of my post-graduate research on earlier layers of human consciousness, it was the lighting of a flame … perhaps the re-lighting. Her book now known as The Goddesses and Gods of Old Europe – then hard to get – presented a view of the world that was so different from the views I had felt were set in concrete. It was the opening up of a heretofore hidden, dormant layer of the human story, a presentation of “the spiritual manifestations of Old Europe”. “Old Europe” itself was a concept brought into being by Marija Gimbutas’ grounded research, which uncovered it as a “distinct culture developing a unique identity” as she writes in the Introduction to her now readily available book. Her work fed both the scientist and the Poet in me, and the one who longed to know her roots in this Earth. Gimbutas’ method was the application of a rigorous scientific mind – Europeon-trained in the discipline of archaeology – in combination with an intuitive sensuous indigenous relationship with her material. And so it is for this great documentary of her life and work, of her theories and her critics, and of her influence on scholarship and consciousness studies. It is itself a document of the complexities and confluences of all these aspects, and pleasurably presented with narration, interviews and animated graphics. Signs Out of Time combines a wonderful collage of images – both photographic and animated – from the extensive excavations that Gimbutas conducted over decades, with story and photos of her life – who she was and what enabled her unique perspective and synthesis. Gimbutas’ scholarship is really beyond question – she had established her award-winning credentials as an archaeologist; and her knowledge of languages, mythology, and folklore was extensive. What disturbs her critics is the audaciousness of her interpretations, how she steps out of line with her interdisciplinary knowledge and approach. Her approach was so new that it came to have its own name: archaeomythology. Signs Out of Time includes clips from interviews with significant people who knew Gimbutas – personally and professionally, some of whom critique her work. Personally I was amused by how often the critics fell into their own web, and to my mind did not offer what I considered to be a problem with Gimbutas’ creative contribution to thought about human cultural origins. 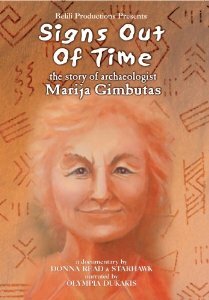 Marija Gimbutas asserted from the evidence she found, and from her extensive first-hand knowledge of her place – including its folklore and traditions – that the earliest layers of Western culture were peaceful, and that the primordial Deity in this place was female. Gimbutas says of the Deity of these Old Europeans: “She is a metaphor of living Earth – nothing else.” Gimbutas grew up in Lithuania where people still kissed the Earth each morning … what kind of shape does such a mind have? And how different is it from what is considered even sane in mainstream media and academia? By her work Gimbutas has called into question definitions of “civilization” and the view of human history as barbaric from the beginning. She describes an early religious understanding that is “not about sacred texts and dogmas”, but a great creative process in the natural world – not separate from culture – that wove the cosmos together, as the narrator tells us in the film. These powers were represented in the form of a female metaphor, whose raison d’etre was not “fertility” in the narrow biological econocentric sense of most interpretations of “goddess” cultures; but it was “regeneration” in a broad rich sense of abundant creativity that included song and dance, art and meaning. Gimbutas describes evidence of a female Deity – “Great Goddess” she names her – who was the morphic form of the great powers of regeneration evident in animal and plant, human, earth and cosmos. As Naomi Goldenberg says in the film: “all historians of religion don’t know very much of the deep religious past – the history of all religions is a great deal of conjecture. Why not these conjectures?” And as another interviewee said, Gimbutas set a new agenda … unleashed controversy and scholarship. Signs Out of Time will get you the best of starts if you have no idea about this worldview; and inspired and moved further, if you are a veteran or somewhere in between.